GRACE obtained its data on the movement of Earth's mass by precisely measuring slight changes in the distance between two spacecraft that flew one behind the other around Earth. 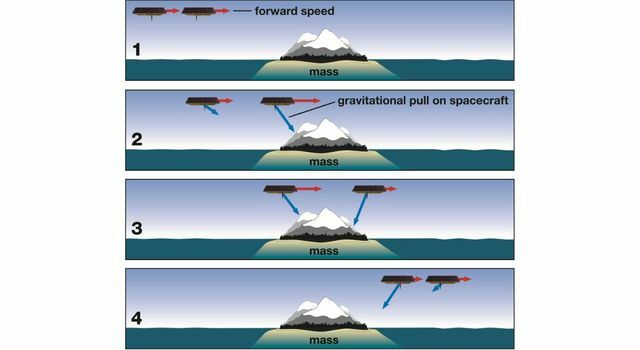 When the satellites encountered a change in the distribution of Earth's mass -- such as a mountain range or mass of underground water -- Earth's gravitational pull on the spacecraft changed the distance between them. The Himalaya Mountains, for example, changed the separation distance by about three-hundredths of an inch (80 micrometers). By accurately calculating each month how the satellites' separation distance changed during each orbit and over time, it was possible to detect changes in Earth's mass distribution with high precision. Measuring the change in the separation between the spacecraft was possible to a high degree of precision because each spacecraft was transmitting microwaves toward the other. The way the waves interacted with each other -- the way they interfered with each other -- created a microwave interferometer in space. This process essentially transformed the two spacecraft into a single instrument that could very precisely measure the distance change between them, which in turn can be related to changes in the mass distribution on Earth. 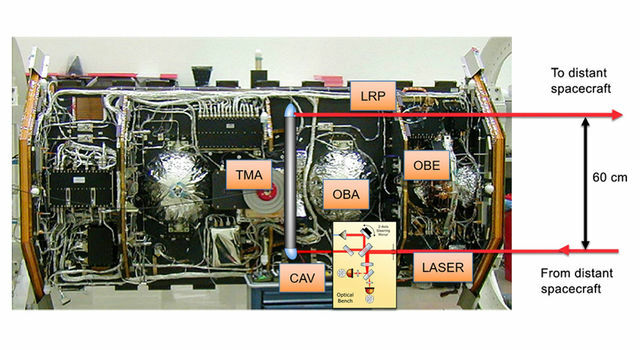 Since the wavelengths in a laser beam are significantly shorter than microwave wavelengths, the laser ranging interferometer will improve the tracking precision of separation changes -- just as measuring in millimeters instead of centimeters would be more precise. GRACE-FO's interferometer will detect changes in distance more than 10 times smaller than what the microwave instrument detects -- changes on the order of 100 times narrower than a human hair. "We're trying something that is very hard -- the first-ever demonstration of laser interferometry in space between satellites," said Gerhard Heinzel, the instrument manager at the Max Planck Institute. "But it's very satisfying to puzzle over a problem and find something that works." GRACE-FO is a partnership between NASA and German Research Centre for Geoscience (GFZ) in Potsdam, Germany. JPL manages the mission for NASA's Science Mission Directorate. Additional contributors to the laser ranging interferometer include SpaceTech in Immenstaad; Tesat-Spacecom in Backnang, Germany; Ball Aerospace in Boulder, Colorado; iXblue in Saint-Germain-en-Laye, France; the German Aerospace Center (DLR) Institute of Robotics and Mechatronics in Adlershof and Institute of Space Systems in Bremen; Hensoldt Optronics in Oberkochen; Apcon AeroSpace and Defence in Neubiberg/Munich; Diamond USA, Inc., and Diamond SA in Losone, Switzerland; and Airbus Defence and Space in Friedrichshafen.